Photos by Evan Krape. Photo of Delaware Stadium by Mark Campbell. 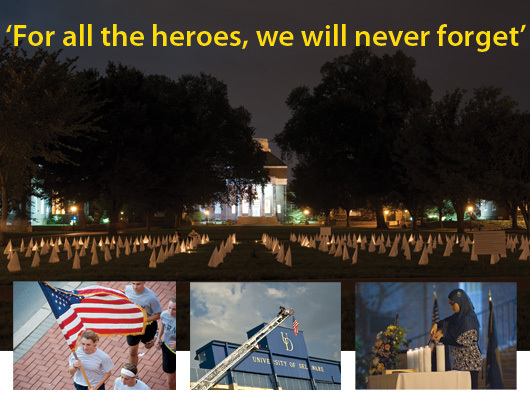 ON THE GREEN | The University marked the 10th anniversary of the 9/11 terrorist attacks with a number of events paying tribute to the victims, rescue workers and armed forces and encouraging members of the UD community to share their thoughts and memories. The largest event was a vigil at which more than 1,000 people came together on a peaceful Sunday evening, Sept. 11, 2011, to remember those who died during the attacks a decade ago. Attendees, who gathered on The Green in front of Memorial Hall, paused to listen and reflect on messages of condolence and hope in an event sponsored by the University Religious Leaders Organization and a variety of student groups. The program began with songs, including The Star-Spangled Banner, and a presentation of the colors by a joint Air Force and Army ROTC cadet color guard. In her words of welcome, Kimberly Zitzner, UD religious and spiritual life liaison, Catholic Campus Ministry, said the terrorist attacks in New York City, Shanksville, Pa., and the Pentagon took place when UD’s newest students were in grade school. In noting that he was asked to begin the same type of service a decade earlier, as the UD campus community gathered on the very night of the attacks, Rabbi Eliezer Sneiderman of the Chabad Jewish Center urged students to continue to look inward and re-evaluate what it means to be human. Members of Newark’s Aetna Hose, Hook and Ladder Company and the UD Emergency Care Unit placed a firefighter’s helmet alongside five large candles honoring those who died on Sept. 11, 2001, and in subsequent terrorist attacks around the world. A lighting of candles concluded the vigil. On the candleholders, students had written the names of all those who died in the attacks. The Green was adorned with 300 white flags—one for every 10 victims of the terrorist attacks—that had been placed there on Sept. 9 and remained on display as a tribute during the following week. Earlier in the day, the Carillon in Memorial Hall had tolled to mark the attacks: 8:46 a.m., the time Flight 11 hit the North Tower; 9:03 a.m., the time Flight 175 hit the South Tower; 9:38 a.m., the time Flight 77 hit the Pentagon; and 10:03 a.m., the time Flight 93 crashed in Shanksville, Pa.
Also, throughout the day on Sunday, cadets in UD’s Army and Air Force ROTC units ran through the campus with the U.S. flag. In other commemorations, the University launched a virtual ribbon garden and special website featuring samplings of messages written on the original ribbons placed on campus a decade ago, thanks to the efforts of University Archives and the Office of Communications and Marketing. As well as sharing the thoughts of those from 2001, the website, www.udel.edu/udremembers911, provided an opportunity for members of the 2011 campus community to express themselves on virtual ribbons. On Saturday, Sept. 10, service personnel from throughout the region were honored during Service Appreciation Night at the football game between the Fightin’ Blue Hens and West Chester University at Delaware Stadium.